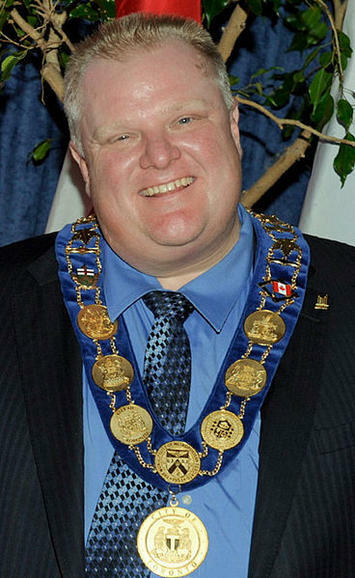 Let me stipulate that I think Toronto’s Rob Ford is a terrible mayor. In fact, while I might not go so far as Richard Florida, who labeled Ford “the worst mayor in the modern history of cities, an avatar for all that is small-bore and destructive of the urban fabric, and the most anti-urban mayor ever to preside over a big city,” I’m willing to say he’s probably in the running for the title. The roots of Rob Ford lie in “amalgamation,” the forcible merging of the city of Toronto government with various of its suburbs by the Ontario provincial government. The idea was cost savings, but of course costs went up. Also, it created a Mars-Venus situation that ultimately led to Ford, a former city councilor in Etobicoke, being elected mayor. This would be like a consolidation of Chicago with Cook County in which a member of the Schaumburg city council ended up mayor. Not good. The urban intelligentsia that despises Ford now find themselves in the embarrassing position of having to explain to their friends that they are in total agreement with Wendell Cox, an implacable foe of government consolidations, who predicted these results. But there’s a big difference between Florida’s bashing of Ford, which falls within the principles of democratic discourse as we’ve come to know it, and what appears to be an effort by some to subvert democracy by finding any pretext to run Rob Ford out of office. I’m not sure where the idea that the loser in an election tries to undermine the legitimacy of the government of the winner came from. But in the modern era it could be the Republican impeachment of Bill Clinton that launched it. This quickly proved to be standard fare. There was the brouhaha over the “selected not elected” George W. Bush as well as the more passionate strain of “birthers” when it comes to President Obama. Given that, especially in the big leagues, there is always some dirtiness in politics, it’s easy to find things to seize upon to claim someone’s holding of an office is invalid. After all, it appears that Clinton really did commit perjury and there was shall we say some murkiness down in Florida. However, these aren’t truly what the people raising a ruckus cared about. What they cared about was the man in office they didn’t like – and getting him out of it. Canada has a reputation as a kinder, gentler nation, but they now appear to have imported from America what Clinton labeled “the politics of personal destruction.” Rob Ford has been the target of a series of vicious attacks, generally aided and abetted (if not outright instigated) by the old city Toronto media that clearly don’t like him, designed to drive him out of office. One was a lawsuit that claimed he should be tossed out of office because of events related to his using official letterhead and such to raise $3,500 for a charity. Believe it or not, the trial judge actually agreed with this and ordered him removed from office. If that’s the threshold for getting someone kicked out of office, I dare say every major politician in America would be gone. Yes, politicians do often use affiliated charities as a, shall we say, lubricating mechanism. Yes, there’s the appearance or even the reality of some impropriety in these things. But this is such small fry stuff that to throw the mayor of the biggest city in the country out of office over it defies belief. If you think this is removal worthy, I’m confident I can find something just as bad in almost any politician that you actually like. Fortunately, saner heads at the appeals level prevailed and the ruling was overturned. Recently we’ve also seen reports originating from, I kid you not, Gawker, in which some shady Somalis supposedly showed a reporter a cell phone video of Rob Ford smoking crack. Shortly thereafter the Toronto Star got in on the act, saying their reporters had seen the video in the back seat of the car, though with the CYA proviso that they had “no way to verify the authenticity of the video.” Other media that may not have directly originated such a story have piled on and thus there’s a firestorm awhirl. Where is the video, you might ask? Good question. Supposedly it’s for sale for $200K but oddly no one snapped it up, not even one of the extremely wealthy Ford haters that Toronto has in abundance. So you want to buy it? Oh, Gawker now tell us it might be “gone.” Hmmm…..
I’m not saying there’s no video. Rob Ford has certainly acted like he’s guilty of something. But it seems amazing to me that in this era in which all types of tapes and documents spontaneously get loose, this one is no where to be found. Also, the idea of the mayor of Toronto smoking crack with a bunch of Somalis while they film him falls into the “extraordinary claims require extraordinary proof” category. The still photo is interesting, but I’ve seen many compromising photos of mayors, who are routinely snapped with all sorts of random people who they may find out later are unsavory characters. I can’t imagine this sort of media feeding frenzy over say, similar allegations against Michael Bloomberg or Rahm Emanuel. The Toronto Globe and Mail is a serious newspaper that’s roughly Canada’s New York Times. Though they didn’t break the video story, they did follow-up with a rather tabloidesque article about the history of Rob Ford’s family with drugs. Ford’s brother Doug, the focus of the piece, is on the city council himself, so is a legitimate investigative target so to speak, but the piece also digs into other family members. Ten people who grew up with Doug Ford – a group that includes two former hashish suppliers, three street-level drug dealers and a number of casual users of hash – have described in a series of interviews how for several years Mr. Ford was a go-to dealer of hash. These sources had varying degrees of knowledge of his activities: Some said they purchased hash directly from him, some said they supplied him, while others said they observed him handling large quantities of the drug. The events they described took place years ago, but as mayor, Rob Ford has surrounded himself with people from his past. Most recently he hired someone for his office whose long history with the Fords, the sources said, includes selling hashish with the mayor’s brother. There’s nothing on the public record that The Globe has accessed that shows Doug Ford has ever been criminally charged for illegal drug possession or trafficking. But some of the sources said that, in the affluent pocket of Etobicoke where the Fords grew up, he was someone who sold not only to users and street-level dealers, but to dealers one rung higher than those on the street. His tenure as a dealer, many of the sources say, lasted about seven years until 1986, the year he turned 22. “That was his heyday,” said “Robert,” one of the former drug dealers who agreed to an interview on the condition he not be identified by name. Upon being approached, the sources declined to speak if identified, saying they feared the consequences of outing themselves as former users and sellers of illegal drugs. The Globe also tried to contact retired police officers who investigated drugs in the area at the time. One said he had no recollection of encountering the Fords. The article is full of innuendo about the Ford’s such as the idea that Rob Ford recently hired a drug dealing associate of Doug’s from the old days (highlighted above), along with curious mentions and links to beatings, killings, and white supremacy/KKK. (Rob Ford is a white supremacist who likes to smoke crack with Somalis???) It’s capped off by having various anonymous sources given pseudonyms so that they appear to be actual people on the record. As this excerpt notes, the police record and police contacts don’t back up the story, which just adds to the general notion of dubiosity and suggests this is a very exaggerated piece that tries to throw things to the wall to see what sticks. All it all, given the extreme reactions to financial dealings that, even if they were proven, would have been a non-issue almost anywhere else, along with a firestorm of allegations about smoking crack and so much more with no actual proof, the Rob Ford affair has thus far generated much more smoke than fire. Rob Ford is the price Toronto is paying for the foolishness of the provincial government and the failure of an urban candidate to offer a compelling vision for the entire amalgamated city. But it strikes me very much that a group of old Toronto city partisans, who are incensed a guy like Ford had the temerity to win an election, are determined to use any means necessary to correct what they see is that injustice. But just as with what happened in America and its politics in the wake of the Clinton impeachment, Canada may come to rue the day a group of its citizens decided to try to overturn an election by destroying the winner rather than waiting for their next opportunity at the ballot box. Photo by Wiki Commons user MTLskyline.